Meet J.C.R. 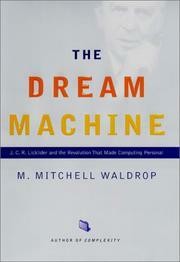 Licklider, the man who put “personal” in “personal computers,” in this lively, memorable, and wickedly detailed biography from Waldrop (Creativity, not reviewed). In what amounts to a history of the computer, Waldrop introduces readers to the men and women involved in the process (from Norbert Wiener and John von Neumann to Gary Kildall) and the process itself (decimal to binary and mechanical to electronic and operator to programmer). Skating his way through so much of this history was Licklider, a psychologist with a bent for mechanical engineering and mathematics, who saw the computer as humane and intimate, as a democratizing tool, but most of all a dreamer who understood that the beauty of the machine lay not in “automating those huge data-processing engines called bureaucracies.” Rather, its glory would be in human-computer symbiosis, wedding the computer’s algorithmic talents with the human’s intuitive ones. And this interaction found its fullest expression in Arpanet—that “intergalactic network” that became the network of networks, the Internet—funded by the Pentagon but then exploding beyond its military confinement. As Waldrop tells this history, allowing readers to follow its multiple paths with the ease and delight of falling dominoes, he gets the names straight for his audience: When we think of the mouse and Windows and word-processing, insert Douglas Engelbart and delete Bill Gates; for MS-DOS, insert Kildall and delete Gates; for the personal computer, insert Licklider and delete Steve Jobs and Steve Wozniak. Along the way, readers will also get a good sniff of the politics involved in working for such institutions as MIT, the Pentagon, IBM, and Xerox, all of which Licklider touched down in during his long career. A rollicking account of a good, old-fashioned visionary who gathered together—under one roof or connected by cables—like-minded visionaries to make the whole expansive notion of personal computing and networking a reality.